A 11-year-old boy with a history of generalized tonic-clonic seizures since the age of 8 months followed by the left focal motor seizures and secondary generalization was referred to a tertiary care hospital for further management. Non-contrast computed tomography (NCCT) of the head showed gyral calcification in the right frontal and right anterior temporal lobe along the Sylvian fissure [Figure 1]a. Magnetic resonance imaging (MRI) of the brain revealed gyral calcifications and cortical dysplasia in the right postcentral gyrus, superior and inferior parietal lobule, and part of the precentral gyrus with leptomeningeal angiomatosis and scalp lipoma [Figure 1]b and [Figure 1]c. The child was referred for 18 F-fludeoxyglucose positron-emission tomography/CT (18 F-FDG PET/CT) which revealed hypometabolism in the right frontal, parietal, and anterior temporal cortices [[Figure 1]d, [Figure 1]e, [Figure 1]f white arrows] corresponding to the areas of gyral calcifications and cortical dysplasias on NCCT and MRI, respectively. Encephalocraniocutaneous lipomatosis (ECCL) is a rare congenital neurocutaneous syndrome of unknown etiology that was first described by Haberland and Perou in 1970. It predominantly involves the meso ectodermal tissues such as meninges, cranial vessels, dermis, hypodermis of the face and neck, connective tissue of the head, and the dermal bones of the skull., Various conditions which have been described in the literature regarding this condition include unilateral porencephalic cyst, ipsilateral lipomatous hamartoma of the scalp-eyelids-eye globe, developmental delay, seizures, and mental retardation. Classical dermatologic hallmark of this syndrome is hairless fatty nevus of the scalp called nevus psiloliparus which was also present in our case. 18F-FDG PET/CT has been one of the ancillary modalities in the presurgical evaluation of drug refractory epilepsy.18 F-FDG PET/CT can provide additional information about the epileptogenic focus affecting surgical decision-making in up to 50%–70% of cases and can also change the initial decisions based on MRI or EEG , in 17% of cases. 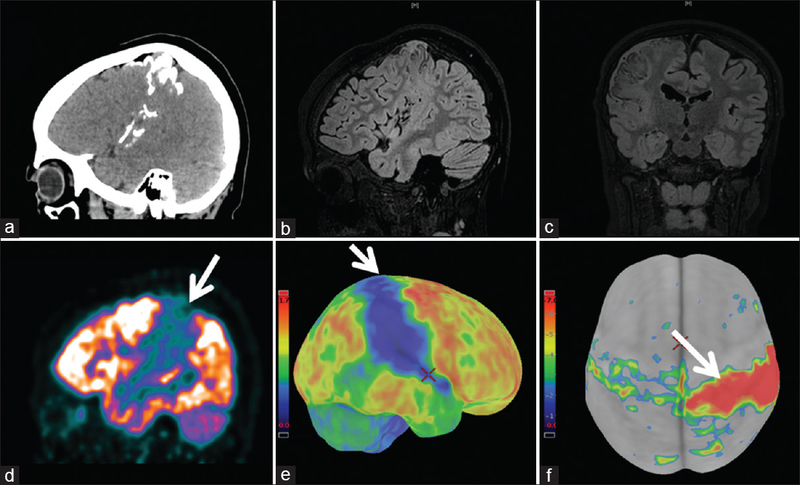 Hemispheric hypometabolism on 18 F-FDG PET/CT has been described in neurocutaneous syndromes like Sturge- Weber syndrome More Details More Details  while TS shows focal hypometabolism corresponding to the cortical tubers. The pattern of hypometabolism in ECCL on 18-F-FDG PET-CT has not been described so far (to the best of our knowledge) in the literature. Haberland C, Perou M. Encephalocraniocutaneous lipomatosis. A new example of ectomesodermal dysgenesis. Arch Neurol 1970;22:144-55. Sofiatti A, Cirto AG, Arnone M, Romiti R, Santi C, Leite C, et al. Encephalocraniocutaneous lipomatosis: Clinical spectrum of systemic involvement. Pediatr Dermatol 2006;23:27-30. Moog U. Encephalocraniocutaneous lipomatosis. J Med Genet 2009;46:721-9. Happle R, Küster W. Nevus psiloliparus: A distinct fatty tissue nevus. Dermatology 1998;197:6-10. Ollenberger GP, Byrne AJ, Berlangieri SU, Rowe CC, Pathmaraj K, Reutens DC, et al. Assessment of the role of FDG PET in the diagnosis and management of children with refractory epilepsy. Eur J Nucl Med Mol Imaging 2005;32:1311-6. Uijl SG, Leijten FS, Arends JB, Parra J, van Huffelen AC, Moons KG, et al. The added value of [18F]-fluoro-D-deoxyglucose positron emission tomography in screening for temporal lobe epilepsy surgery. Epilepsia 2007;48:2121-9. Lee JS, Asano E, Muzik O, Chugani DC, Juhász C, Pfund Z, et al. Sturge-weber syndrome: Correlation between clinical course and FDG PET findings. Neurology 2001;57:189-95. Chandra PS, Salamon N, Huang J, Wu JY, Koh S, Vinters HV, et al. FDG-PET/MRI coregistration and diffusion-tensor imaging distinguish epileptogenic tubers and cortex in patients with tuberous sclerosis complex: A preliminary report. Epilepsia 2006;47:1543-9.